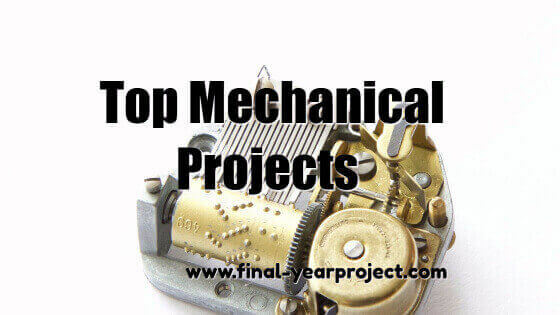 If you are reading this post, you are in the correct place to find best Mechanical projects for your final year. Choosing idea for final year project is very time taking and crucial decision, as it helps you to test your Mechanical engineering study and also helps you in getting good grades. So, take enough time and choose the best topic based on your interest for your project work. To help you get some good ideas for your Mechanical project, in this post we are sharing some of the top Mechanical projects of our blog and you can get an idea on what topics engineering students are making projects. You can also subscribe to FINAL YEAR PROJECT'S by Email for more such Mechanical projects. Gearless transmission is very good project topic for mechanical students and is highly searched project on our website. Do check this project report. Solar energy is a renewable form of energy and if you are thinking to make project on it, check this project. We are sure you must be amazed by compressed air, if this is true this is a project for you. Brakes plays very important role in every vehicle and every mechanical engineer should know how break works. So if you are thinking to make project on breaking, try Hydraulic Brakes. As the name suggests, this project deals with intelligent reverse braking systems and this project can also be a good choice for your final year. Name of the project says it all and if you are fascinated by all those hybrid vehicles, this project report is for you. Jacks are very important for every industry ( big or small ), you will jacks everywhere. This project focuses on specifically "Motorized Screw Jack". Shock absorbers are very important for every vehicle and this project deals with the design and fabrication of regenerative shock absorber. Do check it out as it can be your next project. Looking for making project on dryers? If yes, check this project, which also combines solar energy. Drilling machines are very important whether it is home or industry, we all need it. This project focus on the automatic drilling machine. This is a very interesting project on hand operated mixer machine, do check it out and utilize the power of your hands. Thinking to do something for your country which can strengthen the security. Check this project on "tri barrel hybrid army tank". As its name suggests, this project will help you to understand how the AC system for heavy vehicle works as you will be building project around it. This is Mechanical project report on the Sprocket side stand retrieve system, which help in avoiding accidents which occur due to not lifting off side stand in two wheelers. This is also a good topic for final year mechanical students, both for seminar and project and you will learn about internal gear pumps. This project good insight of how hydraulic floor crane works and in this project you can design and fabricated hydraulic floor crane. This is also a good mechanical project for students and help them build mult-cavity injection mould for jar cap. To know more, check this project report. Wipers plays very important role in every vehicle and if you want to build an automatic rain and fog operated wipers, then do check this project. This project also uses electronic components and with the help of infrared sensors you have to build electromagnetic disk braking system. This is also one of the very famous mechanical project and gives you insight about electro-magnetic piston engine car. If you are interested in making automobile based project, then this is the one. These were top Mechanical project for Mechanical students. Apart from above projects, students are also making project based on the automobile. So do check our article on automobile based Mechanical projects. We will keep updating this list time to time, so you can please subscribe to our blog for more such Mechanical projects.